Grunty loves dressing-up for parties! Sometimes she dresses-up so that she looks just like Miffy. Do you want to look like Miffy too? It’s the summer holidays and Aunt Alice is busy making all different things at the craft table with Miffy. 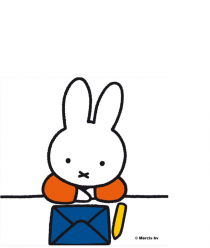 Today, she’s making something extra special to give Miffy – a mini Miffy! When Miffy goes to school, she loves having a packed lunch! Jenny, from The Gingerbread House, loves making packed lunches so she made her very own Miffy bento snacks.